Larry Zeiser keeps naloxone shots in his restaurants. Sometimes the drug, which can reverse the effects of an opioid overdose, goes missing. But he thinks that’s a good thing. “If you think you need to have that in your house, then you grab it. There’s no questions asked, we’ll just get another one. That’s the way it should be,” he said. Zeiser has experienced the opioid crisis firsthand. A few years ago, a server at one of his restaurants in Grand Rapids, Mich., finished a shift and never came back. “We came to find out it was because of an opioid overdose,” he said. Six months later, it happened again. At the time, Zeiser helped sponsor a memorial and donated money in his employee’s name. But that didn’t seem like enough. He brought in a local organization to train managers on using naloxone and to generally educate himself and staff on the opioid crisis. Today Zeiser stocks and restocks naloxone at both restaurants he currently owns, Logan’s Alley and Derby Station, a craft beer restaurant and a pub. A death in a tight-knit business has a lasting impact, Zeiser said. While the industry conversation has recently been dominated by sexual harassment, the opioid crisis “is what’s emerging,” said Carrie Leishman, president and CEO of the Delaware Restaurant Association. She is developing an educational online course to address illicit drug use in the industry. “What we are dealing with is an addiction epidemic. There is no question that staff at restaurants and owners of restaurants in increasing numbers are suffering from opioid addiction, because there is no segment of our society that has been spared from the opioid crisis. 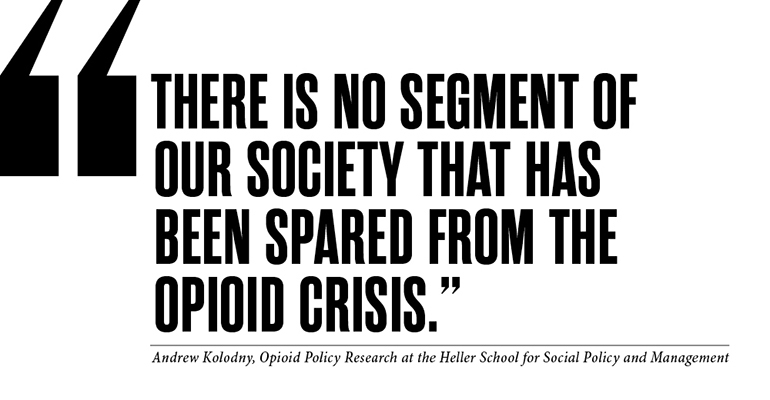 It is affecting every socioeconomic group,” said Andrew Kolodny, co-director of Opioid Policy Research at the Heller School for Social Policy and Management, and the executive director of Physicians for Responsible Opioid Prescribing. Opioids are a class of drugs that include heroin and legal pain relievers such as oxycodone, codeine, morphine and many others. When properly dosed, many patients who are prescribed opioids for temporary pain or permanent injuries can be helped by opioids. Overdoses tend to occur with unregulated drug use, although experts theorize that overprescribing has given the crisis momentum. Opioids are highly addictive, and addiction can easily happen in the course of pain treatment. “Working at a restaurant is an occupation where people often injure themselves and will be exposed to opioids” said Kolodny, who has treated restaurant workers in the past. In recent years, these highly addictive drugs have become deadlier, as a powerful synthetic opioid fentanyl has been increasingly mixed into heroin. Fentanyl has also been found in cocaine. The DEA considers fentanyl to be approximately 50 times more potent than heroin. According to the U.S. Surgeon General, more than 115 Americans die of opioid overdose every day. “Substance abuse falls on high-stress industries,” Leishman said. 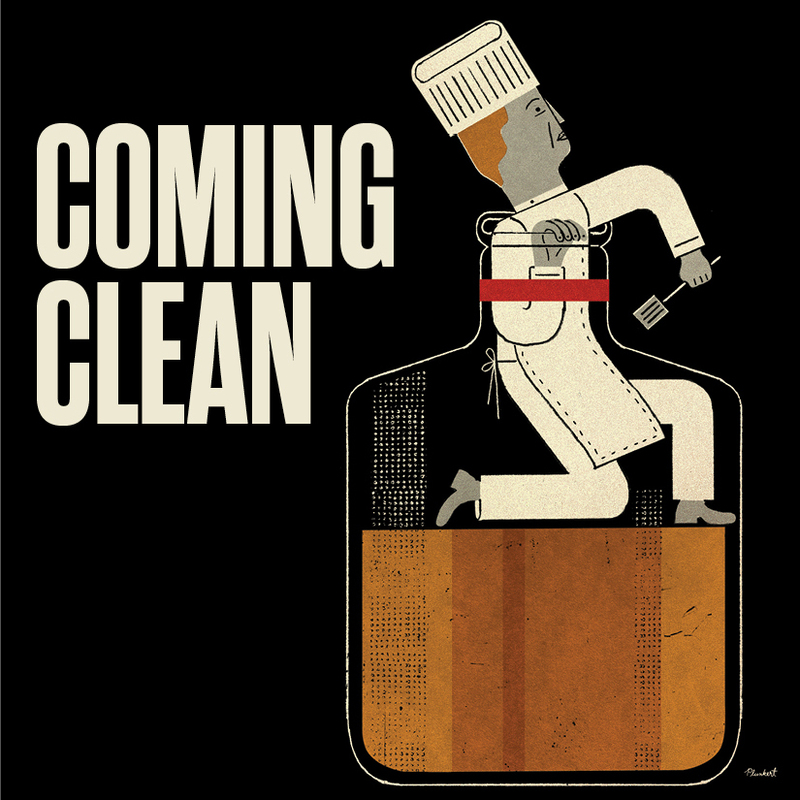 The accommodation and foodservice industries have the highest rates of illicit drug use. Nineteen percent of people employed in the industry have used illicit drugs in the past month, according to the National Survey on Drug Use and Health. Drug use is most prevalent in young people — 18- to 25-year-olds, specifically — who make up a large part of the restaurant industry. The industry hires nearly 15 million people in the U.S., according to the National Restaurant Association. That’s about 10 percent of the total workforce. Joshua Miller, a restaurant owner and Rhode Island state senator advocates for helping employees suffering from addiction and hiring people in recovery. But it’s not just employees impacted by this crisis, Miller said. After a young man overdosed in his restaurant, Trinity Brewhouse, in Providence, R.I., Miller now stocks naloxone. The recent Surgeon General’s public health advisory on the opioid crisis focused on naloxone and urged more Americans to carry the drug. Naloxone is easy to obtain, affordable and getting more so, and those who administer the drug are protected by Good Samaritan laws, the advisory noted. But Leishman stops short of encouraging restaurants to carry naloxone, available in a spray or a shot. “It’s a tough issue, and no one wants to have an image of, ‘Oh, that’s a dangerous place to be,’” said Jamie Richardson, White Castle’s vice president of government and shareholder relations. Restaurants, particularly those with a lot of foot traffic, such as fast-food establishments, are places where drug use and overdoses frequently occur. A recent study published in the International Journal of Drug Policy found that nearly 60 percent of managers at publicly accessible businesses encountered drug use in their bathrooms. The study took place in New York City and included coffee shops, sit-down and fast-food restaurants, as well as non-food establishments like laundromats. Seven of the 86 managers surveyed encountered unresponsive individuals who required emergency assistance. 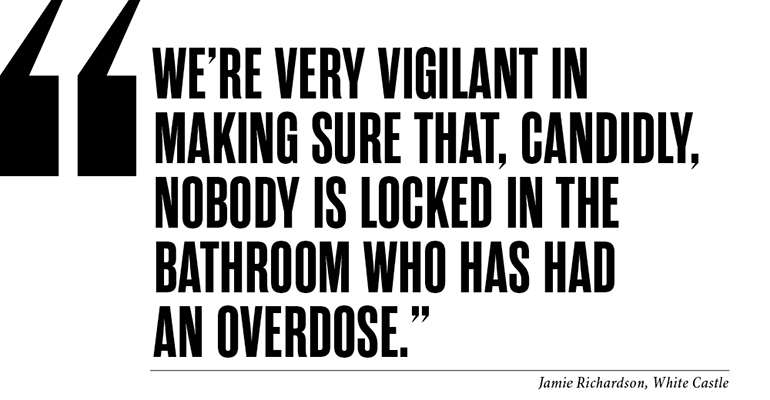 But 90 percent of managers had received no overdose recognition or naloxone training. White Castle was one of the only national chains Nation’s Restaurant News reached out to that was willing to speak on the topic of opioid abuse. The burger chain is based in Ohio, one of the hardest-hit states in the opioid crisis. White Castle franchises haven’t been immune from dealing with overdoses. Richardson stressed the need for awareness of the issue at large and what’s happening at individual restaurants. Is the notorious world of restaurant partying taking a sober turn?